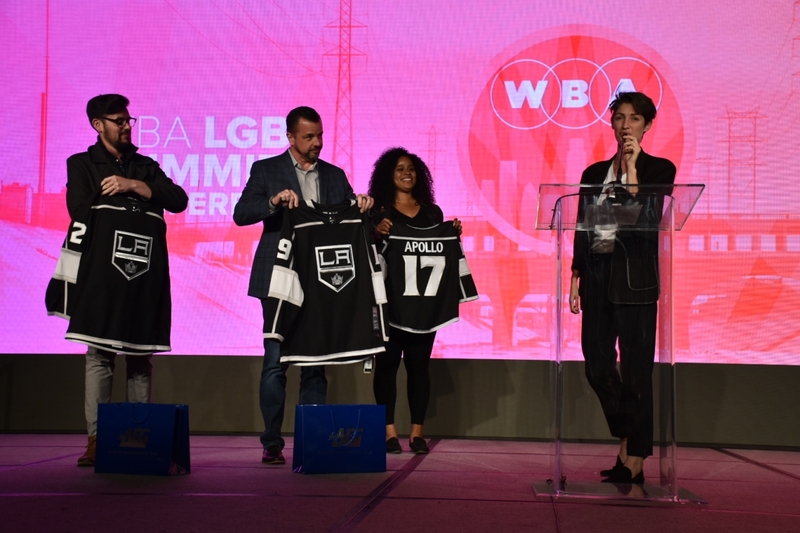 Emma Toshack (right), one of the founders of Nomadica, the business selected to participate in AEG's Inaugural Capacity Building Program, is presented with personalized LA Kings jerseys from members of AEG at the WBA LGBT Economic Impact Summit on March 15, 2019. March 19, 2019 /3BL Media/ - AEG, the world’s leading sports and live entertainment company in the world, and The Los Angeles Gay and Lesbian Chamber of Commerce (LAGLCC) announced that Nomadica, an L.A.-based canned wine company, has been selected to participate in its Inaugural Capacity Building Program. The announcement was made at the WBA LGBT Economic Summit in Los Angeles on March 15, 2019. AEG and the LAGLCC first announced their partnership to develop a capacity-building program designed to promote the economic growth and development of LGBTQ-owned businesses in Los Angeles, earlier in January. “As an LA-based wine company founded by two women, one of whom is LGBTQ, we are thrilled for a company like AEG to be supporting diversity in such a meaningful, hands-on way,” said Nomadica Founder Emma Toshack. In order to be eligible, LA-based organizations had to be LAGLCC members, submit an application and demonstrate strong organizational leadership, a proven track record of success, and have a strategic business plan. Additionally, they were required to articulate a clear, well-thought-out vision for how the Capacity Build Program would advance the organization’s capabilities and long-term viability.